Having issues setting up Web Deploy 3.8 on IIS 7.5 for 2008R2? I feel your pain. 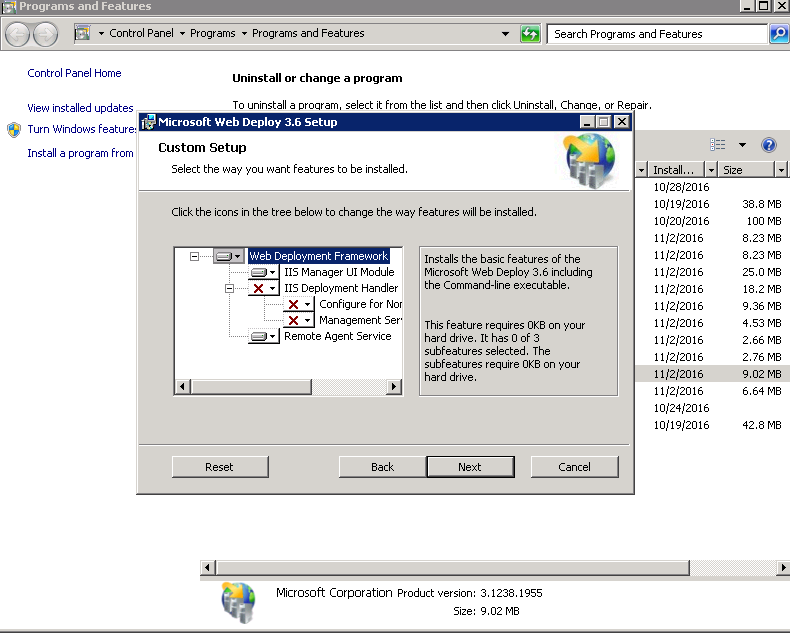 I was installing Web Deploy 3.6 via the Web Platform Installer (WPI) onto IIS 7 on Server 2008 R2, all seemingly goes smoothly, but the interface options in IIS manager don’t show up. Turns out WPI installs it without all the features you’d actually need to deploy software from Visual Studio! The deployment handler is not installed by default. I added these features and completed install. After reboot, still can’t deploy, get an error. Other issues with Wb Deploy 3.6 forced me to uninstall the version installed from WebPlatform Installer and install the latest Web Deploy version directly from Microsoft site, then I was able to deploy.